One Cork club player could have been lining up in Donegal colours in this Sunday’s All-Ireland senior football semi-final. 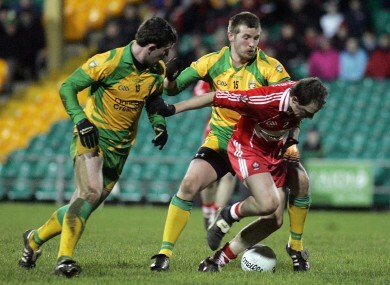 Conor McManus (middle) pictured with Donegal's Patrick McBrearty and Derry's Brian McCallion in a Dr McKenna Cup game earlier this year. PLAYING links between the two counties who clash in next Sunday’s All-Ireland football semi-final in Croke Park are rare but one player has the distinction of having lined out under the management of both Conor Counihan and Jimmy McGuinness over the past four years. Earlier this year Conor McManus was part of Jimmy McGuinness’s county squad during their Dr McKenna Cup Group C campaign. Having moved from Cork to Donegal due to a change in employment, McManus transferred to the Kilcar club, home of Mark McHugh and Patrick McBrearty, and was subsequently drafted in by McGuinness to his setup. In their opening Dr McKenna Cup clash on January 8th against third-level outfit UUJ, McManus lined out midfield alongside Neil Gallagher in their 0-11 to 0-9 defeat in O’Donnell Park in Letterkenny. In their tie on January 15th against Cavan in Kingspan Breffni Park, McManus came on as a half-time substitute when Donegal lost out by 1-14 to 2-8 before finally on January 18th against Derry in Ballybofey, McManus started at corner-forward as Donegal were overturned by 1-8 to 0-9. That marked the end of McManus’s stint with Donegal as he was not involved in their Allianz Football League Division 1 campaign. In April he transferred back to his home club, West Cork side Clonakilty, from Kilcar after his work situation changed and he was deployed in Limerick. McManus is back lining out for Clonakilty in this season’s Cork senior football championship and they are currently preparing for a fourth round meeting with Bishopstown. None of McManus’s clubmates are involved in Conor Counihan’s Cork squad at present but he has previously rubbed shoulders with members of the Rebels side. In 2009 McManus lined out at full-forward in Cork’s 1-13 to 0-6 victory over Limerick in the McGrath Cup final when Counihan was at the helm. He notched a point in that game with current panellists Alan O’Connor, Fintan Goold and Patrick Kelly amongst his teammates on that occasion along with former stalwarts Owen Sexton and Conor McCarthy. Email “Sampling Gaelic football life with the Rebels and Tír Chonaill”. Feedback on “Sampling Gaelic football life with the Rebels and Tír Chonaill”.